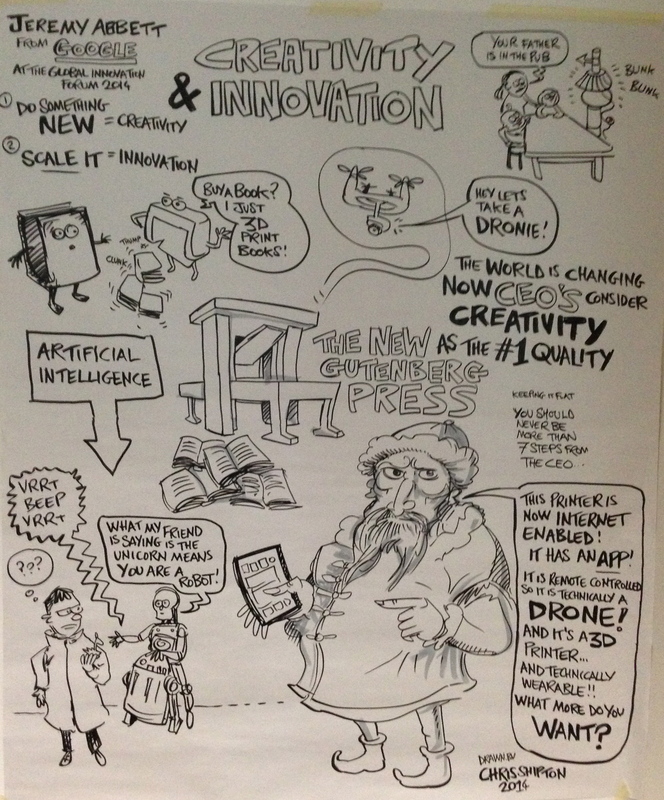 The 2014 Global Innovation Forum gathered a stellar group of of innovative disruptors from organizations such as Google, Facebook, Pixar, IBM, eBay, Skype, Lego, Microsoft Ventures, Amazon Web Services, Pepsico, NASA, and so many more. With interesting speakers and workshops, the forum participants buzzed with idea sharing and best practices about how to break down barriers to change. A consistent theme among the speakers: find the “crazies” in your organization to lead change, by infusing disruptive thinking at all levels. Let’s call it: innovation insurrection, characterized by underground networks of colleagues poised to make change happen when opportunities present themselves for action – like (positive change) sleeper cells. Trevor Davis of IBM talked about the profound effect of urbanization on innovation in the future, serving as a creative catalyst for new thinking. He showed a model for an innovation ecosystem supported by crowd funding, hacking/making, sharing/exploiting, and co-design; with for-profits trickling innovation up and not-for-profit trickling across. The future in his eyes is one of service composition – composition in the sense of music rather than the coding. He predicts the future as “libraries of things” that can be reconstituted into something new by anyone – with or without resources. Highlight for me: learning about IBM’s Chef Watson (cognitive cooking) in a food truck at SxSW last March. Brilliant idea!! The Watson computer first gobbled up domain knowledge of recipes, break through science in food pairing, and chef-brain algorithms, then took requests from hungry SxSW-ers. Super inventive way to explore (computer) culinary creativity by serving exotic cuisine on demand to delight the crowd. The image gallery makes me hungry. Another crazy creative idea: Caleb’s Kola. Manos Spanos from PepsiCo shared how they developed a craft beer-like product to reach the more health-conscious young adult market, created from sparkling water, fair trade cane sugar, and kola nut. The marketing focuses on the kola nut as the natural ingredient well-spring. Caleb, by the way, is the founder of PepsiCo. They’re rolling out the drink in selected restaurants in New York City to create the buzz. You can follow @CalebsKola on Twitter. Clever. Very clever! Manos shared that their small innovation team had to give up the Pepsi trademark in order to inspire a new generation of “kola” drinkers. His keys to making change happen: 1) finding the right internal sponsor, 2) recruiting crazy, passionate people, 3) convincing everyone that change takes time, and 4) stubborn persistence. It paid off, internally. Now, let’s watch Caleb’s Kola become a new brand – a bring within the brand. Jeremy Abbett brought a fresh perspective to how we embrace tomorrow’s creativity and innovation. Forget selfies. “Dronies” [selfies via drone camera] is the next meme on the horizon. Now I want my own drone! He made a distinction between creativity and innovation: “Creativity is doing something new. Innovation is scaling something new.” He urged us to “be Googley” with Moon-shot (10x) thinking to accomplish bold goals for the future. “Technology comes and goes. It’s how we use it that’s so interesting.” His advice: look at the future through the eyes of children…and iconic films. 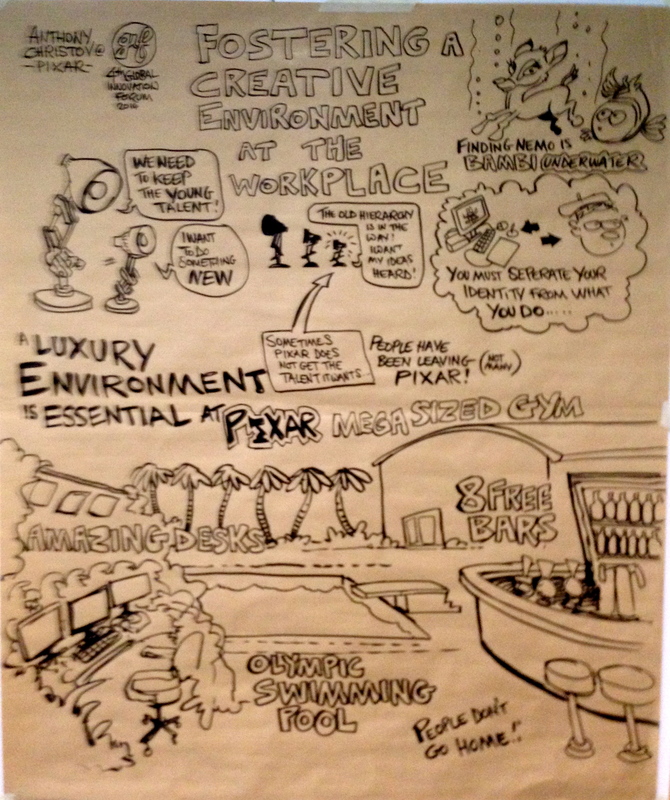 Tony Christov shared the creative campus culture at Pixar – where employees receive allowances to decorate their offices. My want list keeps growing! Without an official decorating budget, my office decoration [quirky assortment of colorful inflatable aliens, retro robots, and homemade spaceship art] will have to keep me inspired. Tony talked about managing the artistic ego – a delicate balance of hubris and insecurity, as well as the need to provide an environment for creative play 24/7. My favorite quote from Tony echoes Ursula Le Guin [above]: “We never get old, we just get grey.” My version: I may be aging, but I’ll never EVER grow up. Rob Newland of Facebook talked about reductive thinking and how all future products should be designed for mobile formats. For Facebook, the internet has unleashed a “meritocratic” environment, when anyone can make a name, or make a dollar, such as “Gangnam Style” video, which has received 2B views, 3 million new views each day – more than 15 years of video viewing for a single individual, and more time in viewing that it took to create wikipedia. Simple build-a-computer products coming out on the market, like Kano, will democratize coding and engineering. Rob encouraged us to learn lessons from “The Danger of a Single Story” by Chimamanda Ngozi Adichie. I’ve provided the link to the transcript from her Ted Talk. Very thought-provoking, and so true: “The single story creates stereotypes, and the problem with stereotypes is not that they are untrue, but that they are incomplete. They make one story become the only story.” Though he didn’t say this, I think Rob’s point is to know your audience. Many stories exist, and often we innovate for our own stories, because we think our story is every story. Make knowledge consumption a regular habit. 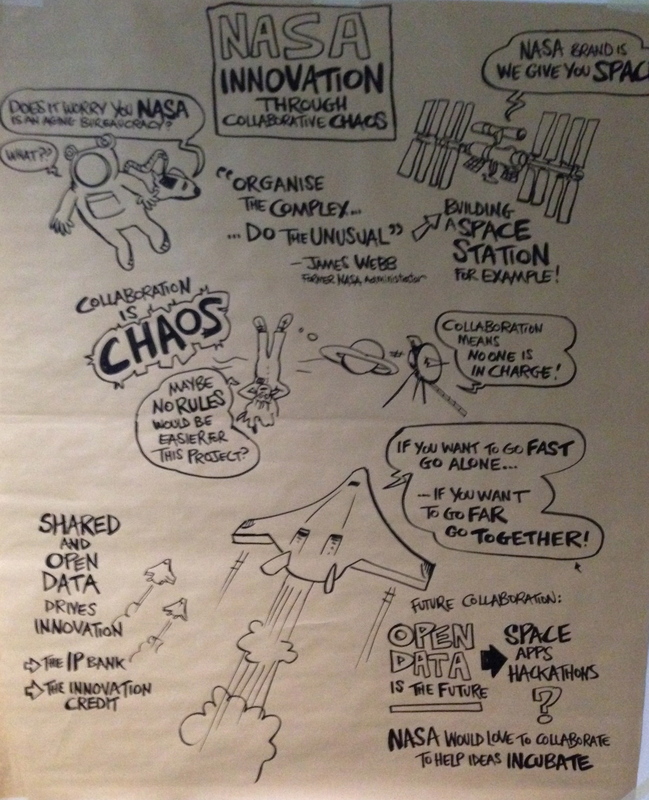 Thanks Global Innovation Forum 2014 for allowing me to join your innovation community. I met so many fellow disrupters. I look forward to what we disrupt together in the future! 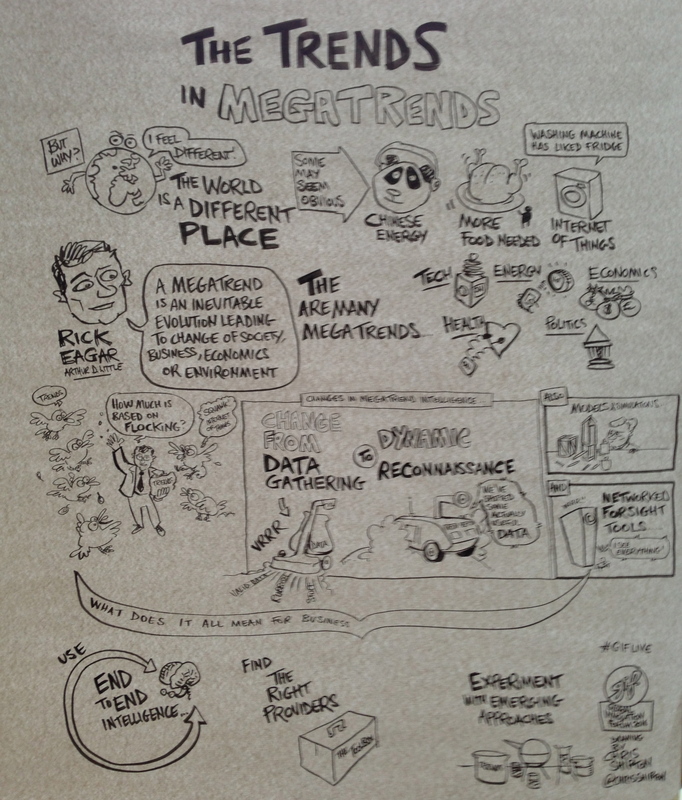 Here’s Chris Shipton‘s visual summary of my presentation.